Is it already day four? Madge is attempting to write a blog post every day this month during National Blog Posting Month (NaBloPoMo). Check out the official site on BlogHer, then come back daily to see how Madge is doing. As you might imagine, as a writer on vintage style and owner of several vintage shops, Madge owns jewelry. A lot of jewelry. It’s a constant struggle to keep all her pieces organized. She’s tried hanging necklaces on hooks, used desk organizers for earrings and bracelets but nothing has worked. 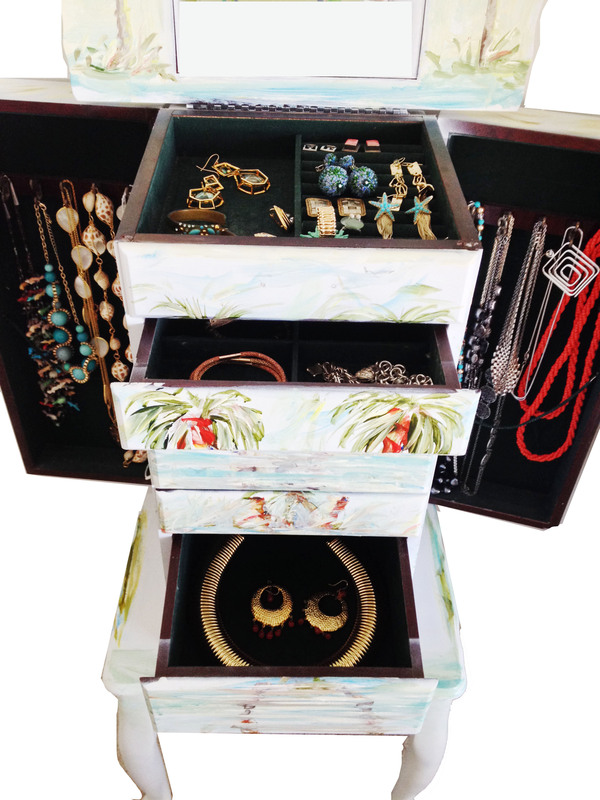 And then she saw it, at an estate sale – a vintage jewelry armoire. As you can see it’s uninspired Early American but man can it hold a lot of loot. 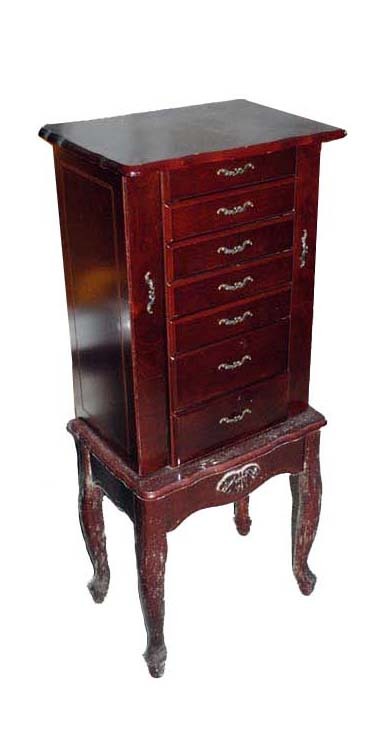 There are side doors for hanging necklaces and lots of drawers for other treasures. Madge snapped it up and hauled it home with visions of sanding and painting dancing in her head. And there it stayed, in the garage for a year, gathering dust. That eager painter chic left the building. Well the jewelry pile continued to grow, and then Madge found her solution in Debbie Brady Robinson. 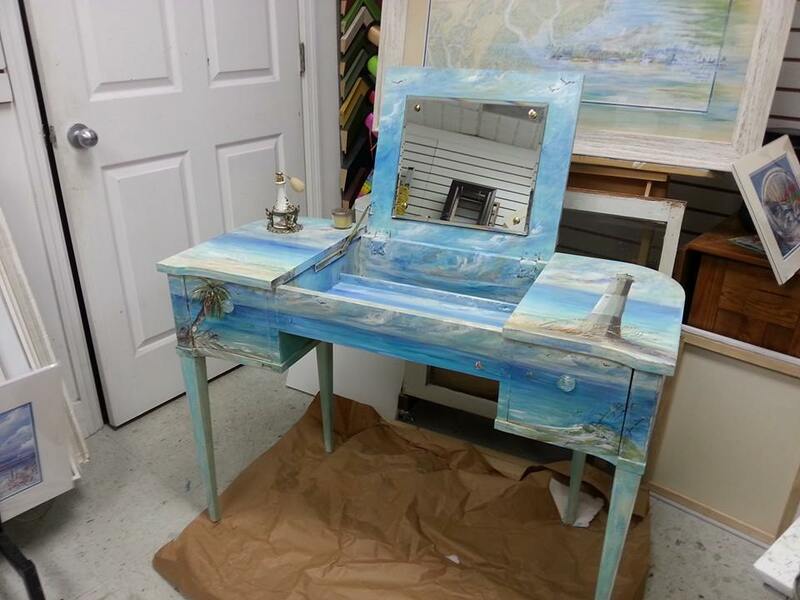 Debbie is a talented artist who lives on Tybee Island, Georgia. 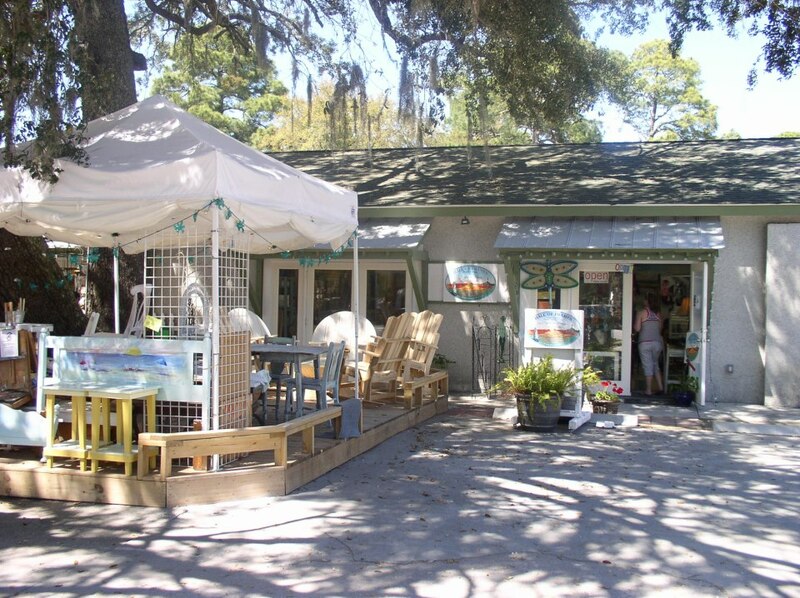 Tybee is an old-fashioned beach town off the coast of Savannah and is Madge’s and Mr. Madge’s favorite getaway spot. Debbie is widely known for her nature and wildlife paintings and beach scenes are one of her specialties. 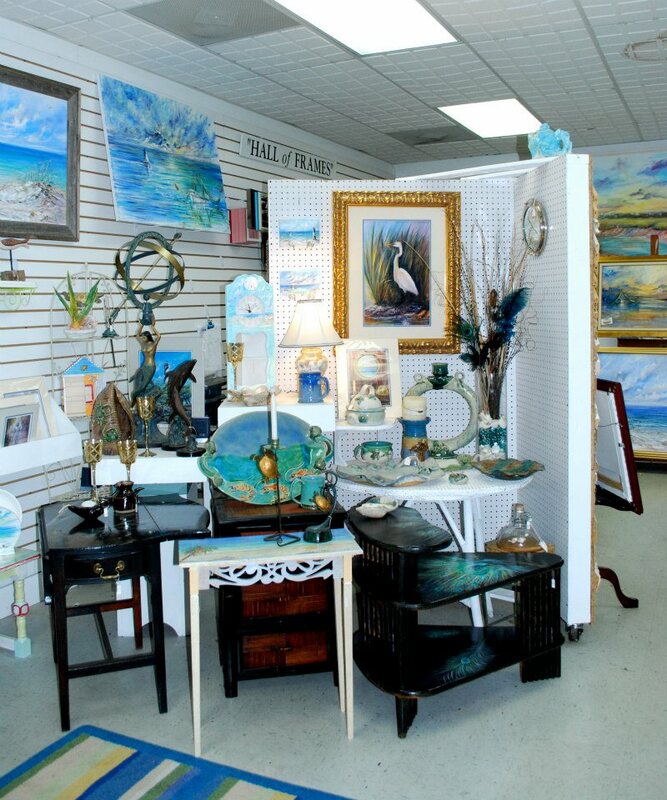 Debbie has a wonderful light-filled space, Signature Gallery, where she sells a carefully curated collection of artists. Many different types of media, including glass and pottery, are represented amongst her own work, all with a nature-oriented theme. Madge loves to peruse the gallery whenever she’s in town and Debbie is always there with her big smile and infectious laugh. 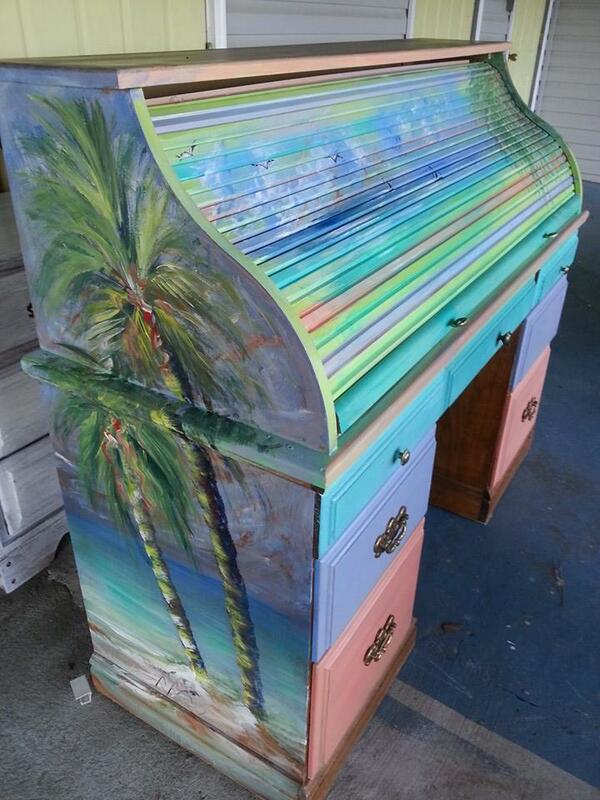 While all the art is amazing, the pieces that Madge loves the most are Debbie’s painted furniture. 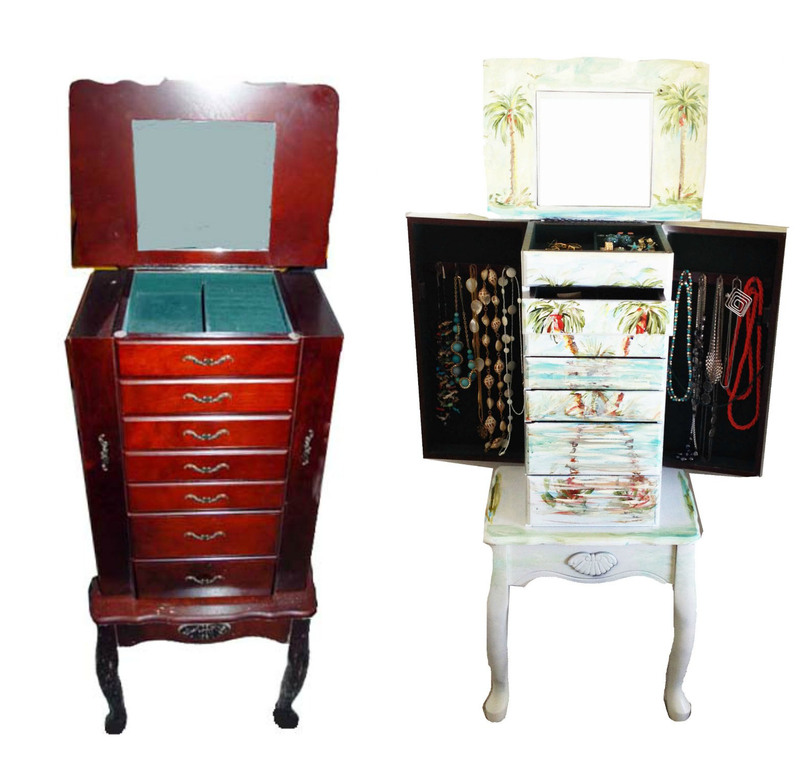 She can take the worst looking side table, desk or chair and turn it into a wondrous work of usable art. Would she perhaps tackle the armoire? 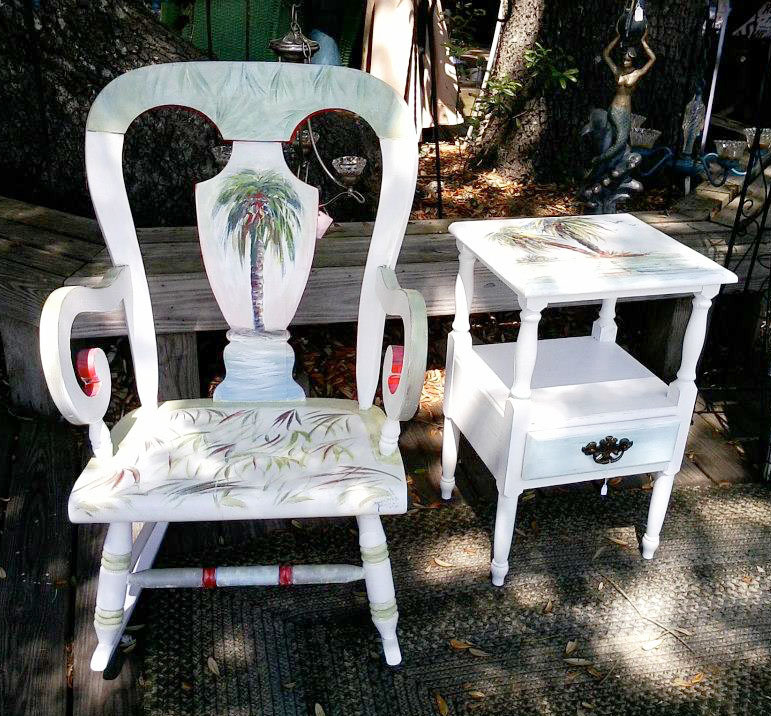 How about this fab chair & side table? 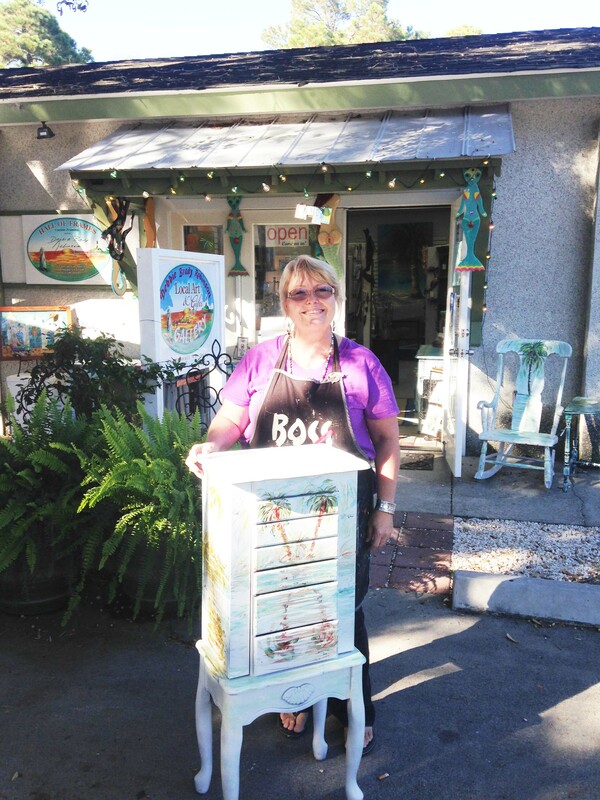 So several months ago, Madge drove the armoire to Tybee and deposited it at Debbie’s gallery. It would be a lot of work, sanding off all that ugly cherry finish then applying several primer coats before she could begin her masterpiece. Madge was resigned that were would be no instant resolution of her jewelry pile. Well Madge is happy to announce that the armoire is finally finished, and it’s a stunner. 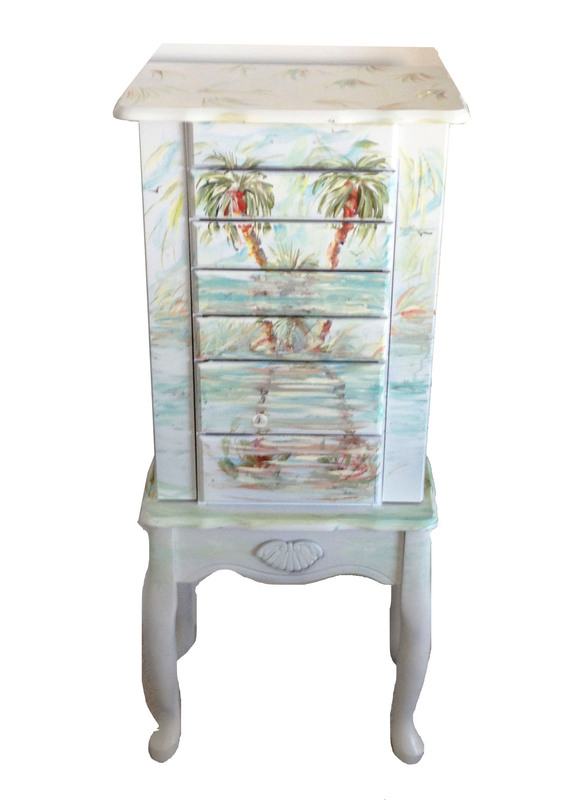 At Madge’s request, it features a colorful motif of palm trees reflecting into the ocean on a white background. Not only a piece of art, it is incredibly functional. Now Madge can see her entire collection and won’t have to go digging to find that one piece. There’s only one problem . . . it’s already full. Those are really stunning transformation. That’s is an amazing work of art. I will surely tell my sister about this as she badly needs to organize her jewelry pieces. Ahhhh…Madge? How are you going to top this? I too was a decorative artist and I loved to transform those pieces into works of art. This is just splendid and I know you will enjoy it for years to come. But…as you remorsed..it’s already full. I look forward to the next adventure…I’m enjoying traveling down this road with you..